The ability of Sweden's aircraft industry is evident in this advanced, multirole fighter, which promises as much as any warplane built in America, Europe, or Russia. Thirty percent smaller than an F-16, the Sabb JAS 39 Gripen is a bantamweight- but in aerial combat it will be a superstar. The pilot has advanced avionics at his disposal, and is pushed through the stratoshpere by a Volvo-built version of the tried and tested General Electronic F404 powerplant. Even though the program has been hampered by two spectacular aircraft losses-from which the same pilot twice ejected successfully-the two-seat JAS 39B will soon join the growing fleet of Gripens. 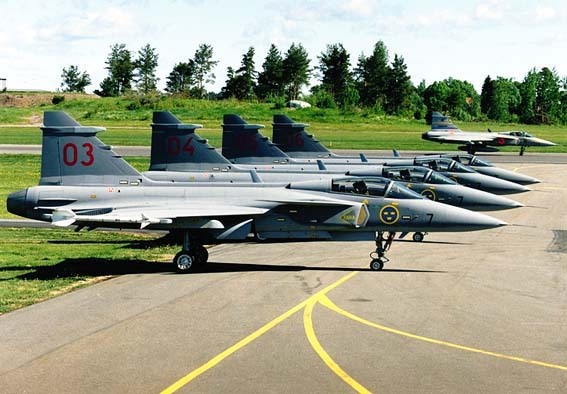 Gripens have already started augmenting the highly capable Viggens of the Swedish air force. In the post-Cold War international climate,the Stockholm govenment hopes for lucrative export sales of this superb-performing, highly promising lightweight fighter.